4 ports design can easily transfer photos, videos, music and files between iOS devices,Macbook pro/type-c devices,Android phones and Computers,a flexible way to meet with your need at any time. aluminium shell,compact and stylish body,makes it a stronger device for daily use.Keychain design can be attached to your keys,convenient to carry around to work and other places,use it whenever you need to. 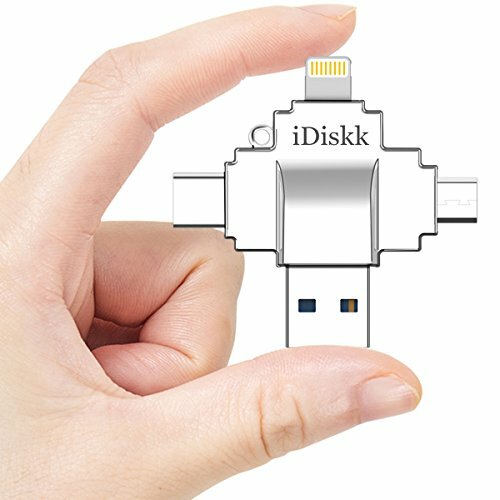 * No need to download and install APP "iDiskk Pro" when using the 4 ports flash drive on Android, Type-C device and Computers, please enter to the phone "file manager" to operate. ✔【AUTOMATIC PHOTO or VEDIO BACKUP】 -Shoot photos/videos via in-app camera and automatically back them up on iDiskk USB Drive. Capture every moment of your life.